Michee Efete (centre) spent part of the summer playing for Icelandic side Breidablik. 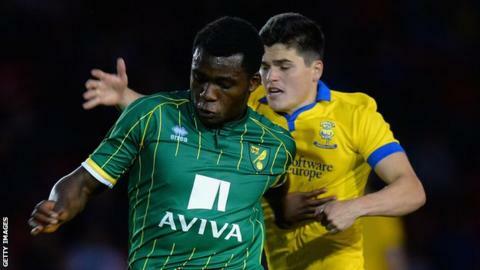 Torquay United have signed Norwich City defender Michee Efete and Bristol City midfielder George Dowling on loan. Efete, 20, spent a brief loan spell this summer with Icelandic Premier League side Breidablik and will be at Plainmoor until January. Dowling, 18, has joined on an initial one-month loan deal after a stint last season at Weston-super-Mare. The Gulls have also signed former Eastleigh and Staines left-back Chinua Cole, 23, on non-contract terms.